A few months back, I started experimenting with different Chinese liniments and I’m quite impressed with the results. While everyone is different, I think some of theses things could make a big difference for older athletes out there—and maybe a few young ones too. As I described in an earlier post, I’ve been a big fan of Chinese dit da jow liniment for quite some time. I came across this remedy somewhat skeptically when a massage therapist handed me a bottle in the middle of the Ride the Rockies about 20 years ago. I had hundreds of miles of hard cycling to go but my IT band had tightened up so badly I couldn’t bend my knee more than 10 degrees. After massaging in the magical liniment, I went to bed with a still-stiff knee. I woke up and my knee was perfectly fine. I continued using the magical dit da jow for the rest of the ride and finished just fine. As I mentioned in my earlier post, I had a few “go to” remedies for when injuries and sore spots crop up. Nevertheless, I felt that the dit da jow formulas that I was using weren’t perfect for day-to-day use because they were a little too sticky. For instance, they weren’t terribly helpful when my plantar fasciitis kicked up because my socks would start sticking to my feet and I would get blisters. This set me off researching other Chinese liniment solutions that might be a little more practical to use for day-to-day training. 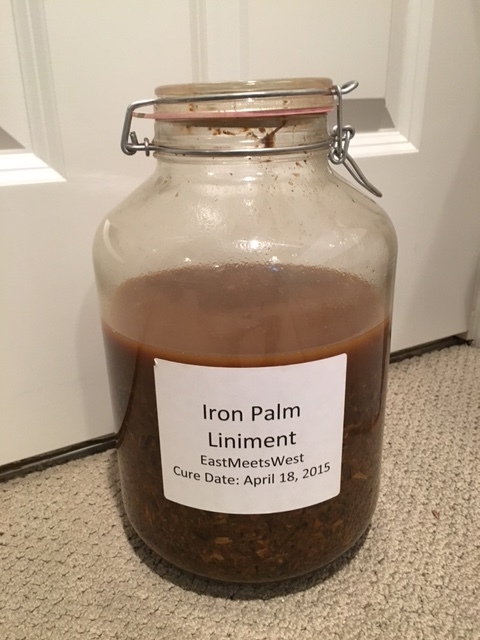 One of the solutions that I came across was an Iron Palm formula from East Meets West. I read the product description and watched the videos on their site. I also emailed Nick, the owner of the company. Different schools of martial arts each had their own secret Iron Palm and Dit da Jow formulas. I learned that Iron Palm is primarily focused on strengthening muscles, ligaments, and tendons to the stress of martial arts training. Martial arts students would rub Iron Palm formula into their hands, arms, feet, and shins to prepare them for the repeated trauma of hitting. Immediately, I thought to myself, running is also a sport where we get injured from the repeated trauma of hitting—maybe there was something useful to these formulas for an endurance athlete! Nick also confirmed that he has several endurance athletes who use his formulas for exactly this purpose. Another feature of true Iron Palm formulas? They aren’t the slightest bit sticky. They rely on Chinese herbal medicine to move Qi and strengthen muscles, ligaments, and tendons. Last winter, I started experimenting with a western analogue that cyclocross riders would know very well: embrocation. And, in doing so, I think I may have a clearer idea about why Iron Palm formulas may be so useful—at least from a western perspective. If you have ever used embrocation, you will know how warming they can be. If you’ve seen cyclocross races in cold, wet weather with cyclists riding in shorts and wondered to yourself how they can do that without pulling a muscle or trashing their knees, embrocation is the answer. It’s also how my high school cross-country coach got us through our races in the cold autumn weather of western Massachusetts. Iron Palm isn’t nearly as warming as embrocation, but it does have a very faint warming tingle to it. That really helps me warm up before my workouts. But unlike embrocation, it can be used without trouble in the warmest weather. But, even beyond these western benefits of Iron Palm, it also has brings with it all the ancient benefits of Chinese herbal medicine. Dit da Jow formulas are different. They are more about treating injuries and reducing inflammation and less about fortifying tissue. 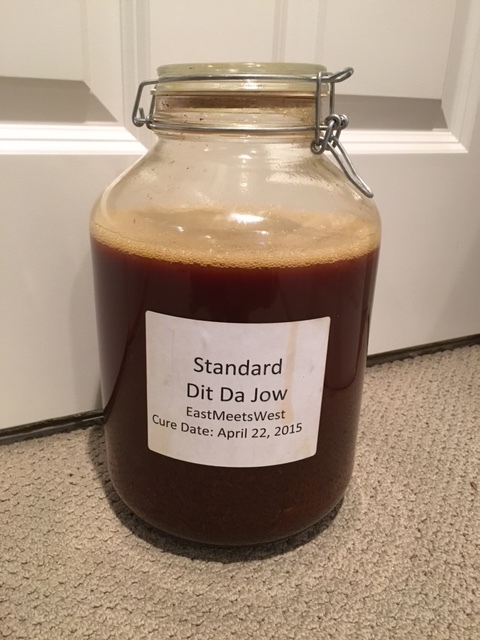 While stickier than the Iron Palm formula, the East Meets West Dit da Jow formula is far less sticky or “dirty” than other dit da jows that I have used in the past. This makes them a better fit for everyday use but I hesitate to add that they don’t entirely replace the stickier Dit da Jows that I mentioned in my last post. Instead, I think each one has a purpose. For really awful endurance athlete woes (like my IT band issue during the Ride the Rockies), I’ll still take the stickier Dit da Jows, making sure to massage it in like crazy. But for more everyday aches and pains, I now use the East Meets West Dit da Jow. If Iron Palm is the eastern equivalent of embrocation, then Dit da Jow is their equivalent to an ice pack. Most Dit da Jows have a cooling and pain-relieving aspect to them. The East Meets West formula has a good dose of natural camphor and menthol in it. Unlike ice, however, Dit da Jow does a great job at promoting circulation. If you’ve searched online, you may know that ice is somewhat controversial in its effectiveness and Chinese medicine has always eschewed its use on injuries. Instead, Chinese medicine relies herbal formulas like Dit da Jow to reduce inflammation while promoting circulation and reducing pain. And, if you’ve read about Dit da Jow online, you’ll know that it does a particularly good job with bruises and other trauma-related injuries. Should you decide to try the East Meets West formulas for yourself, I would recommend picking up a 5 liter Bormioli Rocco Fido jar off Amazon. Nick’s formulas are all made to order immediately before sending out—Nick is very particular about freshness. His formulas are also extremely concentrated and enormous—just the herbs easily fill half of these enormous 5 liter containers. In addition, you’ll need a little over a gallon of the cheapest plain vodka you can find (I found that Trader Joe’s vodka is perfect). Stick with the regular 80 proof variety—more alcohol does extract more goodness from the herbs more quickly, but it also evaporates too quickly and tends to make the formula too “hot.” Leave a bit of room at the top (e.g. only fill to the bottom of the shoulder of the jar) so you can shake it vigorously. If you shake it vigorously at least once a day, you’ll have usable liniment about 2 months later and fantastic liniment a year later. The more you shake, the better it becomes and the faster you get a usable liniment. So What About My Plum Dragon’s Formulas? While my day-to-day training relies pretty heavily on the East Meets West formulas, I still have a place for my Plum Dragon Herbs formulas. 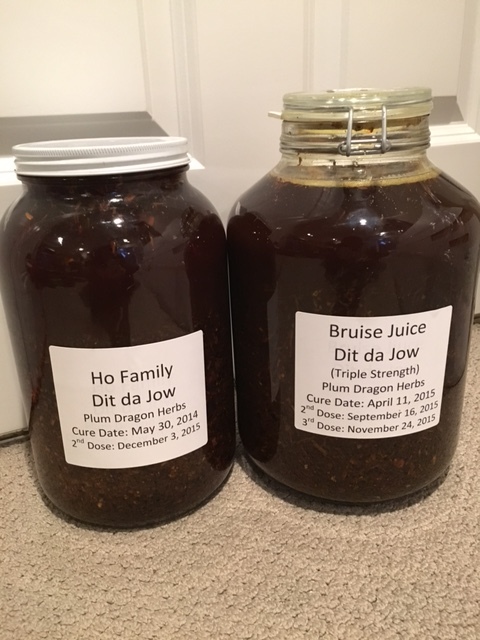 Among the “stickier” dit da jows, their Ho Family Dit da Jow and Bruise Juice are pretty incredible. Unlike the East Meets West formulas, these aren’t really traditional dit da jows. Instead, they are largely modern reformulations of older formulas. As they tend to be stickier, I don’t use them during workouts– or usually even immediately afterwards. Instead, I use these formulas in the evening or right before bed. I reserve them for recovering from really painful spots– the kind that I know will come back to haunt me in the morning. I then thought that, if I was only using their formulas once a nasty injury had developed, why not make them really concentrated? I remembered an email thread I had with Josh at Plum Dragon Herbs. Josh recommended concentrating his formulas by mixing two or more packages of herbs in a single gallon of vodka. So I took an extra herb pack and mixed it in with my gallon of one-year old Ho Family Dit da Jow. And, I moved a gallon of Bruise Juice to a 5-liter container and added in two more herb packs, making it into a triple-concentrated witches brew of herbs. These dit da jows are shaken on an almost daily basis so they are pretty darn potent. East Meets West Iron Palm. This is my day-to-day pre-workout formula. I use it liberally on my knees, calves, and any other place that takes a lot of abuse when running. I also use it after workouts along with their Dit da Jow. East Meets West Dit da Jow. This is my day-to-day post-workout formula. I use it on all the same places as Iron Palm– and any hot spots that crop up during a workout. Plum Dragon Bruise Juice. I use this at triple strength for any injuries that I know are otherwise going to feel awful in the morning. For instance, if my IT band is flaring up badly around my knees or I’m developing patellar tendinitis, I will rub this stuff in three times (letting it dry each time between applications). Then wait 10 minutes and repeat the whole process three times (nine times total). This leaves a thick, sticky coat of Dit da Jow. I’ll then go to bed and, more often than not, the issue goes away by morning. Plum Dragon Ho Family Dit da Jow. For long-standing injuries, Bruise Juice is a bit too cooling and something with more of a warming effect is needed for increasing blood flow. This is where this Dit da Jow comes in handy, particularly at higher strengths. The basic rule of thumb: if swelling is present or it’s a new injury, use Bruise Juice. If there is no swelling or it’s an older injury, use Ho Family. ← 100 Posts and More to Come!